As many of our readers know, we have recently moved home. The first day we moved in we encountered many problems with our home phone. This was mainly down to the rubbish home phone which we had. Telephone calls were cracked and I found I was repeating myself many a time. In the end I stopped using my home phone as calls were getting interrupted and I thought that I could use my mobile for calls however I soon found out that most of the numbers I was trying to call were premium rate numbers and would cost a lot on my mobile. I had no choice but to ring on my awful home phone however before I managed to run a huge phone bill up on my mobile Gigaset came to our rescue and in the end I was able to ring up the business's I needed to in style. 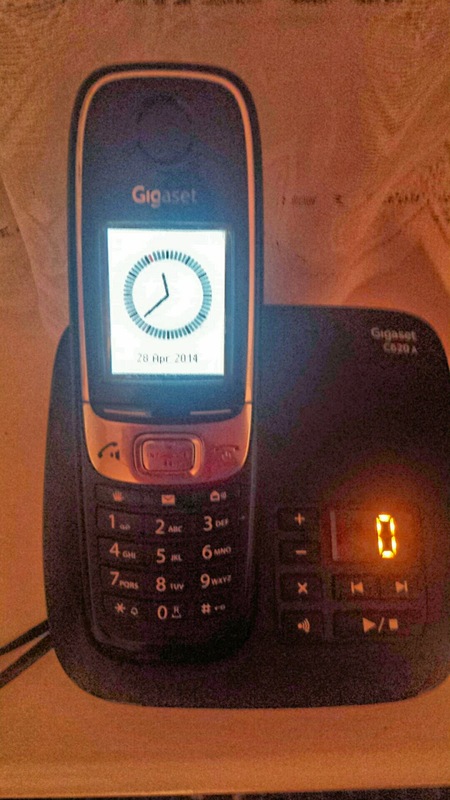 Gigaset sent us one of their clever family phones, the Gigaset C620A. At a RRP of £59.99 I was expecting a lot as in my own mind £59.99 was a lot of money to be shelling out on a phone however Gigaset came up trumps and the phone did have a lot to offer. 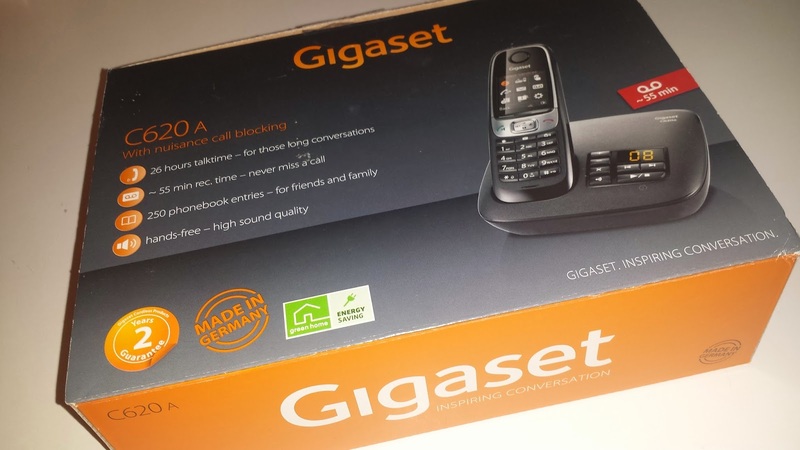 The Gigaset phone came in a small box, it was very easy to put together and within a few minutes the phone was plugged in. The phone came with a user guide explaining how to set the phone up quickly, these instructions really helped me to get the phone in a working state. They were simple to follow and easy to read and I could understand the picture diagrams. Once the phone was plugged in I was able to put the correct date and time on the phone and I was able to choose a fun ringtone. The ringtones which the Gigaset phone have to offer are fun and really I could compare them to some of the ringtones which I would find on my mobile as they are very clear and of high quality. Once I had set up the ringtone I then went on to input the phone book entries. I often manage to forget numbers, especially my Mums and my Grandads so it was brilliant to be able to store the numbers on my home phone which I use to call them instead of on a piece of paper which could often get lost. A brilliant feature to this phone is that the phone can store up to 250 entries which makes it not only great for family use but it could also be perfect for small business use. I have to admit I was a little worried about the battery life as I often talk to my Mum for long periods of time and after I sometimes manage to forget to put the phone back on charge however once analyzing the instruction booklet I was able to find out the that phone has over 26 hours talk time and the phone also has a 530 minute standby time. A few other little things which are perfect about this phone is that it has a answer machine, although no one has left us a message yet the phone has 55 minutes recording time and can be remotely operated which means you can use it when you are away from the house. The phone also has a nuisance blocking call feature which means that annoying calls can now go unanswered and you will not be disturbed in the day. Overall I was extremely impressed with the quality of the phone. From a hands free speaker to energetic, fun ringtones the phone has something to offer every family and even small business. The phone is great to look at thanks to its call standby clock settings and its sleek black design. The phone is strong as well as resistant. I would 100% reccomend this phone. It can be bought on Amazon at the present moment for just £44.99. A great little extra to this phone is that more than 1 can be bought and they can be dotted around your home making it easier for calls to be answered. We no longer have a landline phone and just use our mobiles, but those premium rates numbers are expensive. This looks like a great phone, and perfect timing! We have a landline, but I really don't use it! In fact, the only time it rings is when it's sales or cold calls! We only have it so that the parentals can call us. 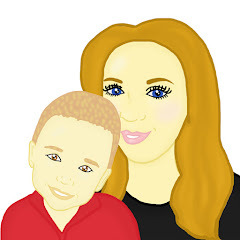 Landlines are good though for the free and premium rate calls - both which cost on my mobile! I have a landline for 'emergencies' but it's only usually cold callers that I end up talking to on it. I do have a landline, but use my mobile the most. It seems this phone has decent battery life.I am looking for a new house phone so will check this out. We have one of these and it's great. I always find the alternative number to business numbers so I can use the free minutes on my mobile, saves a fortune! We have three handsets with our home phone. I need one in the office, one downstairs and we also have one in the kitchen! My landline phone hasn't been working well for a while, so great to read a review of another as I really need to splash out. I don't like using my mobile for all my calls. Wow I'm so impressed by the hours that you can keep talking or just having on standby - that's amazing. Looks like a really nice phone too. looks good - though we have an old fashioned phone as we don't really use the landline! Ooooo love this! We have a handset with out home phone. Actually looking for a new on. This one is proper cool. We have a landline but very rarely use it...this looks fab though!